Prior to the advent of satellite positioning, geodetic systems were based on a mathematic model of the Earth which best fits over a specific area. The surveys were developed for mapping requirements where precision of a meter was considered satisfactory. 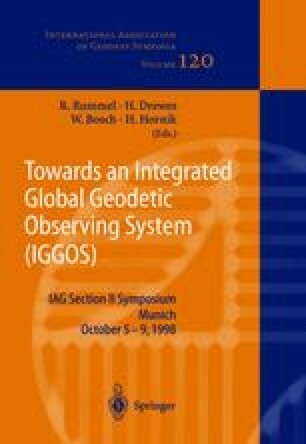 With the adaptation of space positioning techniques by the scientific community, the geodetic systems assumed a global character where centimetric precision could be obtained by these systems. As a consequence of the new technologies, the change from local datum to geocentric reference systems is required, in order to make the information compatible on an international level. To this end Brazil has been involved in the definition of the South American Geocentric Reference System (SIRGAS), whose purpose is to establish a geodetic system for the whole of South America. Brazil will complete the next step to accomplish this change. The integration of Brazilian Geodetic Network to SIRGAS will be carried out through a simultaneous adjustment of the network using the software Geodetic Adjustment using Helmert Blocking of Space and Terrestrial data (GHOST). In the adjustment, the GRS80 ellipsoid will be adopted and all Brazilian Network will be constrained by 11 SIRGAS stations within the national area. Terrestrial and spatial data will be combined to generate coordinates for about 5000 stations. Some comparison studies about geoid model quantities to be adopted in the adjustment will be presented as well as some preliminary adjustment results.